More than 300 communities and one million Californians are exposed to unsafe drinking water from the taps in their homes, schools, and communities each year. This crisis has gone on for too long. For our health and our children's safety, California needs to create a Safe and Affordable Drinking Water Fund. legislation (SB 844 and SB 845) to solve California’s long-standing drinking water crisis. The legislation builds upon the original proposal for a Safe and Affordable Drinking Water Fund, with changes made to ensure broad support and effective implementation – because California families with toxic water cannot afford to wait any longer. Polling shows that more than two-thirds of Californians support this type of solution to our drinking water crisis. Editorial boards at the Los Angeles Times and San Francisco Chronicle also urge legislators to support! Media inquiries should be directed to Community Water Center's Communications Manager Kelsey Hinton at (916) 706-3346 or kelsey.hinton@communitywatercenter.org. For questions about the Safe and Affordable Drinking Water Fund, please contact Community Water Center's Policy Director Jonathan Nelson at (916) 706-3346 or jonathan.nelson@communitywatercenter.org. I live in your district, and I am deeply concerned that my fellow Californians do not have access to safe and affordable drinking water. More than 300 communities and a million Californians lack access to this basic human right. Some families are paying as much as 10 percent of their monthly income for drinking water. The Governor's proposed budget invests in creating a Safe and Affordable Drinking Water Fund. 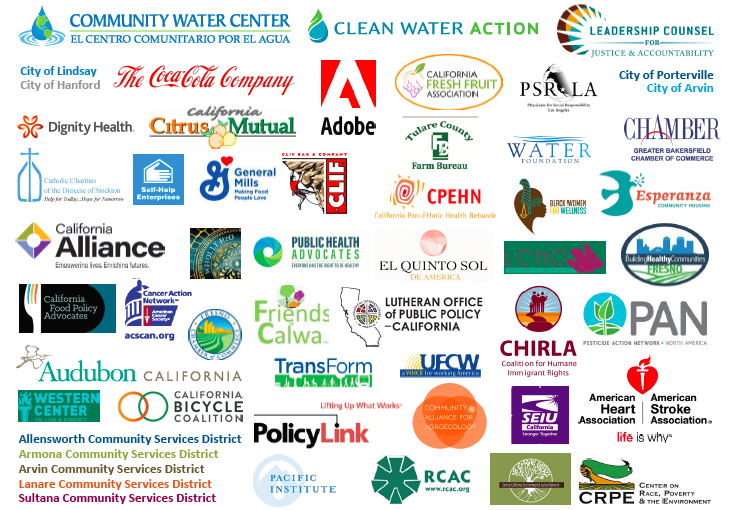 We urge you to support this effort to finally make safe and affordable drinking water a reality for our fellow Californians. This solution would provide an ongoing source of funding to ensure all Californians have access to safe and affordable drinking water. The Fund is supported by a broad and diverse group of more than 100 organizations. I strongly support a Safe and Affordable Drinking Water Fund, and recent polling shows that I am not alone — more than two-thirds of Californians approve of this approach. Please support the Fund! In the sixth largest economy in the world, we can and must ensure that all Californians have access to safe and affordable drinking water. *You'll receive a call from 559-554-2417 that will provide you guidance on what to say to your officials, and then patch you through directly to them. Urge the legislator to support the Governor's efforts to create a Safe and Affordable Drinking Water Fund.